Time to clean up those profile photos, folks! Smile, we can see you! Time to freshen up those Google+ profile photos, because the latest flavor of Android will start using them to identify users as part of the new caller ID by Google service. 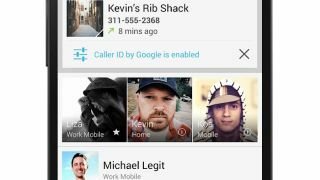 Google Engineering Director Attila Bodis announced November 5 on his Google+ page that the company's caller ID will be getting a little more personal early next year. In an effort to help make it easier to identify who's calling, Google will start using Google profile photos in early 2014, which will be displayed on incoming and outgoing calls on phones with Android 4.4 KitKat. Caller ID by Google is part of the new phone app included with the latest version of Android, which now matches Google Places listings for businesses as well as looking up contacts from Google Apps domains. "Coming in early 2014, users who have verified their phone number and have discovery turned on will have their names and Google profile photos display whenever they call you, or you call them," Bodis explained. Google claimed the feature is "great if a new friend who hasn't been saved in your contacts yet calls you," but not everyone will be thrilled to have their profile image broadcast with every call. Google+ users are encouraged to "make sure you are happy with how you appear on caller ID" by visiting your Google Account - especially since the only opt-out seems to be removing verified numbers and/or turning discovery off. Check out our review of Microsoft's new Surface Pro 2!